Maybe you can relate. Exhausted from a spouse required to work more than you’d like and the constant neediness of small children or a calendar with way too many things on it, you’re overwhelmed. Tired. Or perhaps just overloaded with responsibilities and problems that just won’t go away. There’s no disputing that life is busy and at times downright draining. The concept of rest plays hide-and-seek with us way more than what’s fair, while we sputter along on empty, thinking we’re the only one in the world wishing we could go on an extended vacation. But even the disciples needed a break and didn’t get one. Mark 6:31 tells us Jesus and His crew were so busy, they had no time to eat! (Sound familiar?!) People were in and out and coming and going, and life was crazy. So Jesus says to them,“Come away by yourselves to a desolate place and rest a while” (Mark 6:31). Okay Lord, that sounds lovely. So Jesus and the disciples got in a boat to make haste to a desolate place, but when the people saw them leaving, “they ran there on foot from all the towns and got there ahead of them” (v. 33). I wonder what the disciples were thinking when they got to the other side and saw the crowd. If it were me, I would have been sitting in the boat displaying my best pout face and promptly requesting for Jesus to make them all go away. This is my time to regroup and relax, and I deserve it. But Jesus didn’t make anyone leave. Not even close. Instead, He taught the crowd right there on the shore, smack dab in the middle of the disciples’ hopeful moment of reprieve. When at last daytime turned to evening, the disciples saw their chance, and said to Jesus,“This is a desolate place, and the hour is now late. Send them away to go into the surrounding countryside and villages and buy themselves something to eat” (vv. 35–36). But Jesus didn’t make the people go away. Instead, He told the disciples to feed the hungry crowd. (Um, excuse me?) Knowing the disciples were a bit taken back, Jesus offered a little guidance. “How many loaves do you have? Go and see” (v. 38). The disciples returned with five loaves and two fish, and the rest is history. Jesus fed the massive bunch of them right then and there with just a small amount of provision, until every last one in the crowd was satisfied. The feeding of the 5,000 is a miracle we’re still perplexed by today. A miracle clearly displaying the power of our sovereign Savior. Yet if the disciples had gotten their way, they would have missed it. There’s no doubt they needed rest. Prior to this, they had been on a ministry trip, walking two-by-two from town to town with merely a walking stick in their hand (vv. 7–13). They had been in homes of strangers for who knows how long, proclaiming the hard-to-hear message of repentance, casting out demons, and healing the sick. They were tired. They were overworked. They were hungry. Which just so happens to be the perfect time for God to display His power. The Lord says in 2 Corinthians 12:9, “My grace is sufficient for you, for my power is made perfect in weakness.” When we don’t have enough to give, it’s God who fills the gaps. When we don’t think we can go on, it’s God who gives us the strength. Just like God took those two loaves and five fish and multiplied them to be enough, God can always take the little we have to offer and make it more than enough. Experiencing God at work in my life is a miracle I hope I never tire of. To be empowered and strengthened through the Holy Spirit is better than alone time. Yes, we all need rest. But when I let God work in my heart, I am resting. I’m resting from trying to do it on my own and coming up short. I’m letting God carry my burdens and trusting in Him instead. Yet Christ at work in our lives is a miracle we tend to overlook because it’s not the kind of miracle we’re searching for. While we’re busy asking God to make the problem go away, God’s busy enabling us to walk in godliness right through it. While we’re busy looking for peace in our circumstances, God’s implanting peace in our hearts. We ask for God’s help and don’t see it because it’s inside and not out. 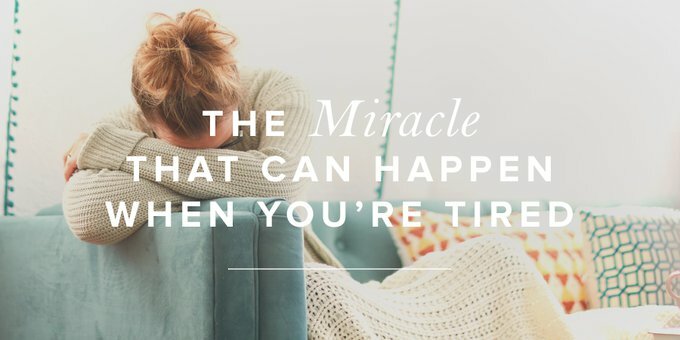 So, if peace and quiet doesn’t seem to be on the docket today, if you get pushed further into the depths of chaos and kids and laundry and dinner and unexpected phone calls or fevers or tantrums or wishful thinking, maybe it’s because instead, what God really wants to do is give you a miracle. Filling you with patience when you didn’t have any left. Overflowing you with love when there was no love to give. Offering self-control when it’s the furthest thing from your mind. Through the promise of God’s Holy Spirit, we become partakers of the divine nature—the same nature that raised Christ from the dead. By grace through faith, the gospel doesn’t just save us once but daily from corruption and sin, as we live in the power of Christ. This power is made most evident when we’re tired and just can’t deal with the kids any longer. Or we’re spent and just can’t serve anymore. Or we’re done and just can’t put any more effort into our marriage. Have you not known? Have you not heard? The LORD is the everlasting God, the Creator of the ends of the earth. He does not faint or grow weary; his understanding is unsearchable. He gives power to the faint, and to him who has no might he increases strength. Our God does not grow weary as we do. Instead, He does miracles when we’re tired, when we just don’t think we can go on. He knows we are weary and is there to help. The question is, will we let Him? From our team: One way that you can find rest in Christ is by memorizing and meditating on His Word. We have a resource to help you do just that—the Seeking Him Scripture memory cards. This month, you can get a copy of these for a gift of any amount toward the ministry of Revive Our Hearts. Click here to get your set. And . . . did you know this blog is 100% donor funded? Help other women find freedom, fullness, and fruitfulness in Christ by becoming a Monthly Parter. Learn more here. Stacey Salsbery is a farmer’s wife and mother of four. When she isn’t serving a meal on the side of the road, riding in a tractor with her husband, or driving kids to practice, you’ll find her escaping the crazy by writing devotionals at Deeper Devos, where she gives readers a weekly practical and deeper look at God’s Word. Her favorite things in the world (not counting her Savior, husband, and kids) include flipping houses, buying new books, and going for a nice long run. Stacey and her family reside in the cornfields of Indiana.